CORVALLIS, Ore. – Scientists have determined for the first time that Amazon’s waterlogged coastal mangrove forests, which are being clear cut for cattle pastures and shrimp ponds, store significantly more carbon per acre than the region’s famous rainforest. The long-term study, recently published in the journal Biology Letters, provides a better understanding of how mangrove deforestation contributes to the greenhouse gas effect, one of the leading causes of global warming, said J. Boone Kauffman, an ecologist at Oregon State University who led the research. The Brazilian mangrove forest fringes the entirety of the Atlantic Coast at the mouth of the Amazon, the largest river in the world with the largest mangrove forest. Although preservation of the Amazon rainforest has been the subject of intense awareness efforts over the last few decades, less attention has been paid to the Amazon mangroves. Mangroves represent 0.6 percent of all the world’s tropical forests but their deforestation accounts for as much as 12 percent of greenhouse gas emissions that come from all tropical deforestation. Mangroves are a group of trees and shrubs that live in tropical coastal intertidal zones. There are about 80 different species of mangrove trees. All of these trees grow in areas of waterlogged soils, where slow-moving waters allow fine sediments to accumulate. 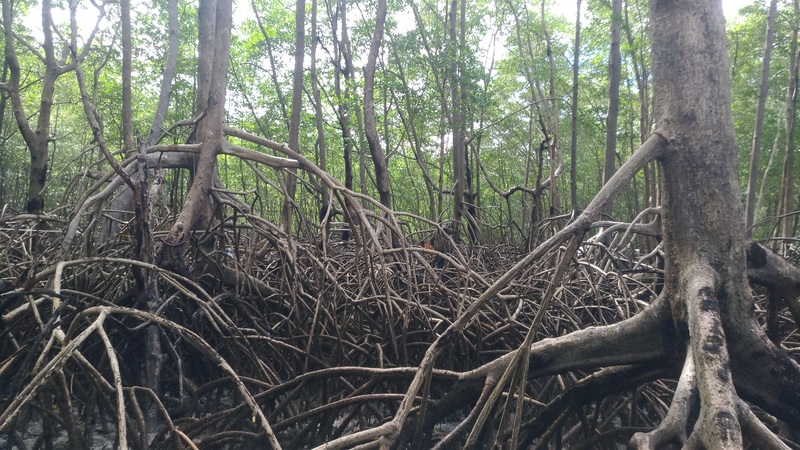 In these environments, mangroves sequester significant quantities of carbon that is stored for centuries. For the study, the researchers visited nine mangroves and three salt marshes within the Brazilian Amazon. The Oregon coast, like much of the United States, features salt marshes along its coast and estuaries. Salt marshes, mangroves and sea grass communities are collectively referred to as “blue carbon” because they hold vast carbon reservoirs and their conservation is of value with respect to climate change mitigation. Mangrove forests are also important for biodiversity. They are known as “kindergarten of the seas.” This is where young fish spawn and reproduce and spend the early parts of their lives. Clear-cutting mangroves presents another threat: The people who live along the coast just behind these forests become more vulnerable to storms when they are cut down, Kauffman said. Kauffman’s co-authors were Leila Giovannoni, a student in OSU’s Department of Fisheries and Wildlife in the College of Agricultural Sciences; Angelo Bernardino and Luiz Eduardo de O. Gomes of the Federal University of Espírito Santo in Vitoria, Brazil; and Tiago Ferreira, Danilo Jefferson Romero, Laıs Coutinho Zayas Jimenez and Francisco Ruiz of the University of Sau Paulo in Piracicaba, Brazil. Partial funding for the study was provided by the U.S. Agency for International Development, Sustainable Wetlands Adaptation and Mitigation Program.